Hey friends! 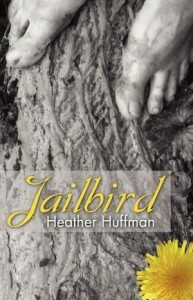 Today I’m very excited to have Heather Huffman, author of Jailbird, join us at the bar. I met Heather a few months ago through the lovely people at Booktrope and after reading her novel, Jailbird, I thought, “Karen, you need to interview this woman.” So, without further ado, here is the lovely Heather Huffman! KD: Can you tell us a little bit about Jailbird and where the idea for the story came from? HH: Jailbird’s story follows Neena Allen from her accidental jailbreak to the small town she lands in. The book actually begins in the middle of her jailbreak – that scene came from an incredibly vivid dream that inspired the book. In the dream, I saw everything through the eyes of a woman breaking out of prison. I saw what she saw; I felt what she felt. Also in the dream, there was no speech, no conversation, until I saw Charlie Russell and asked, “Who’s that?” Those are the first words of dialogue in the book, too. Jailbird is more than the story of Neena’s jailbreak and subsequent new life. It’s a beautiful love story. It’s Neena’s journey to reclaim her humanity and the healing of her soul. KD: Neena’s story is both heartbreaking and inspiring. She met adversity and through strength and hope she found her way. Is she modeled after someone you know or is she more of a collective thought of what a strong woman should be? HH: Neena is a little me, a little of who I hope to be, and a lot of the women I see all around me everyday. Her plight seems so horrible; just the other day I heard that 1 out of 3 girls will be sexually abused by the age of 18, so it’s not an uncommon one. The details of her story are exceptional, but the heart of her tale is something many of us can identify with. Neena’s strength is a combination of the beautiful strength and power of the women in my world. KD: I absolutely loved the exchanges between Neena and, well, everyone. Her side of conversations were fast, quick-witted and honest; I felt as if I could pick up a conversation with her easily. Did you have a favorite Neena exchange or moment to write? HH: It makes me happy to hear you say that – I genuinely like Neena. I think we’d be friends if she were real. My favorite scenes with Neena are the ones where she got tongue-tied around Charlie. That always made me smile. KD: Due to the nature of Neena’s back story was there a scene or section that was particularly hard to write? HH: Talking about the night of Neena’s attack was always tough. It was more than deciding how much to share – though that was part of it. I’m a visual writer; I often see the scene play out as I type, and many times it’ll keep playing over and over until I finish writing that particular part of the story. Those scenes were tough to watch. KD: You write romantic suspense, what draws you to this genre? HH: I didn’t pick my genre so much as it picked me. I just write down the stories in my head, and this is where they happened to fall. I suppose the fact that two of my favorite things in life are adventure and love might have had something to do with it, though! KD: Who are some of your favorite authors? Are you currently reading anything? HH: When I’m not actively writing, I read a wide variety of books. Lots of classics line my bookshelves; they’re my favorites. When it comes to modern writers, I find myself buying a lot of Jennifer Crusie’s books. I used to tear through Nora Roberts books like crazy. At the moment, I’m reading something completely different. It’s a book called the Harbinger by Jonathan Cahn. When I finish that, I plan to catch up on some of the books by my fellow Booktrope authors! KD: Your stories revolve around women who haven’t been dealt the best hand yet find a way to not just survive but thrive. Have you always been an advocate for social injustices for women? How did you become a part of the movement against human trafficking? HH: I’ve never been able to keep my mouth shut when I see injustice. I believe that if something’s wrong, I should try to fix it. Why wait for someone else to step up? I became part of the fight against human trafficking when I learned it existed while researching Throwaway. At first, I struggled to find a way to plug into the fight. When I started using my writing as a way to raise awareness, things fell into place. I began to connect with some amazing organizations on the front lines like Project Liberty and The Covering House. KD: Your voice as a writer is strong and well developed, how long have you been writing? HH: First, thank you – that means a lot to me. In answer to your question, I’ve been writing books for as long as I can remember. I got serious about honing my ability to write a novel and share it with others about four years ago. KD: When you’re not writing how do you spend your free time? HH: What’s that? My family recently moved to a 10-acre homestead, so tending the garden and animals is where the bulk of my non-writing time goes. I love to create – sewing, embroidering, weaving, refinishing furniture… the list goes on. I spend a lot of time with my kids; they are a lot of fun, and we have some pretty fantastic adventures together. In fact, as soon as I finish up with work today, we’re taking the dogs on a creek walk. That’s my kind of evening. KD: Are you currently working on anything new? HH: The next book is just wrapping up – look for Devil in Disguise to begin hitting the online shelves mid-June. I’m giving my brain a writing break until August, when I’ll start working on Roses in Ecuador, which tells the story of Devon McAllister. His sister was the main character in Ring of Fire. Thank you so much, Heather, for stopping by the pub! I can’t read wait to read more from you and I urge you all to check out the wonderful works by the talented and wonderful Heather Huffman! 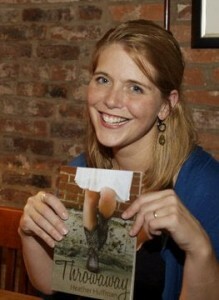 You can find out more about Heather on Twitter, Google +, Facebook, and on her website. You can find her books on Amazon, and Barnes & Noble. This entry was posted on Friday, May 25th, 2012 at 7:00 AM	and is filed under Writing on the Rocks. You can follow any responses to this entry through the RSS 2.0 feed. You can leave a response, or trackback from your own site. Another great interview, Karen! I really enjoyed getting to know Heather better. I also look forward to reading her books! Thanks for stopping by, Christina!! Heather’s books are amazing, definitely check them out! Thank you both! I had a lot of fun being here today. Christina, I hope yoi enjoy the books. Karen, your kindness is apprecoated! Okay, I seriously hate trying to reply from a smart phone. Two typos in one comment. Grr. Sorry about that! No computers were harmed in the 0.189 seconds it took to produce this page.